One of the most interesting boats in Hout Bay Marina is the Pelican 42 "Domicella". Everytime I walk past this boat she preoccupies my mind for another 20 minutes or so. Besides her beautiful lines, she has a two-masted unstayed rig, and she is a Lavranos design - which raises the interest factor considerably! Enigmatic, beautiful and well pedigreed! Also quite different. She oozes street-cred as a cruiser and a classic, and clearly will be interesting to sail. So what's she all about? Thanks to Roy McBride for this pic, taken recently at the closing cruise of Hout Bay yacht Club. 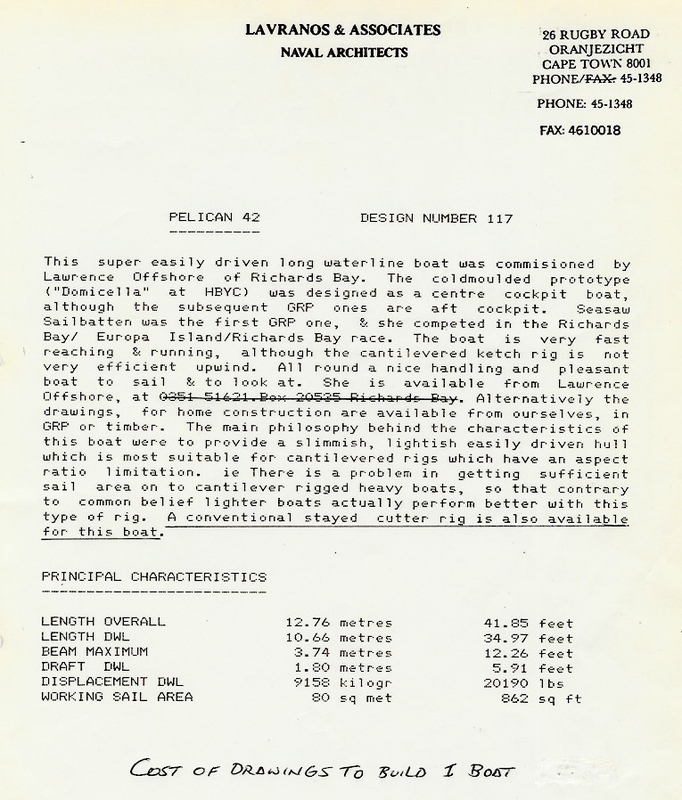 Well it turns out that Domicella is a cold-moulded wooden boat, of a design called the "Pelican 42". 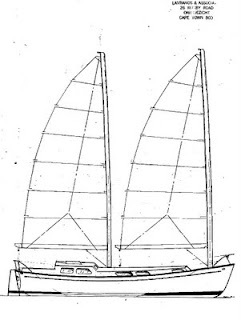 ﻿She was conceived by Bruce Hancocks and Colin Lawrence, both veteran cruisers, who combined their minds to create "The Ultimate Cruiser", in a quest for simplicity, practicality in a "less is more" concept. 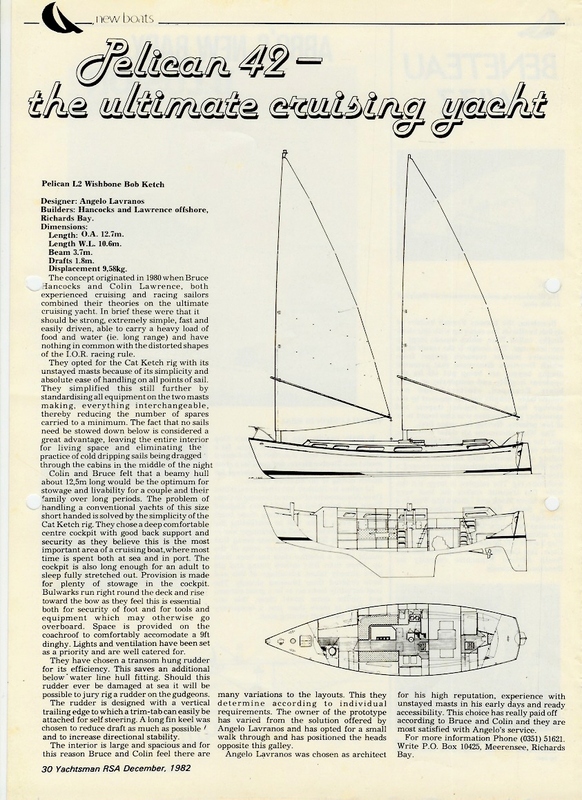 They chose the great Angelo Lavranos to design her - very skilled in all aspects of yacht design, but specifically for his experience in unstayed masts at that time, in 1982. Any discussion about the Pelican 42 must start with the rig. I never met Hancocks or Lawrence - but suspect their fascination of simple cat-rigged unstayed masts was probably inspired by the Freedom 40 ketches of the 70s, perhaps with a nod to the simplicity of cat-rigs and junk-rigs. The presumption is that a two-masted ketch using unstayed masts is the ultimate cruising rig. 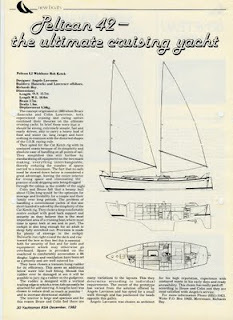 It is very easy to handle (self-tacking), cheap to build and maintain, great performance in trade wind sailing (moderate speed for winds not on the nose), and leaves the boat uncluttered with stays etc. Sails do not have to be stowed below decks, and sail changes are not required. This was at a time when roller-reefing headsails were not readily available. IMS or IRC rules were harshly banished in this concept - which is corinthian, traditonal, practical, and perhaps a touch romantic. 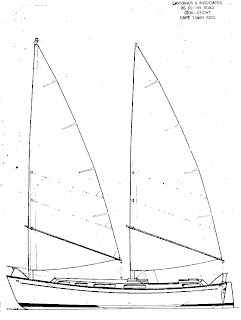 Hancocks and Lawrence wanted a beamy boat that could carry good cruising loads of water, fuel and stores. However these requirements are somewhat at odds with a "cantilevered rig" which can't easily deliver the power needed to drive a heavy boat. Lavranos therefore aimed for an easily driven hull, slender and not too heavy, able to be driven by this rig. The result is a beautiful hull, with loads of space, and great classic lines. 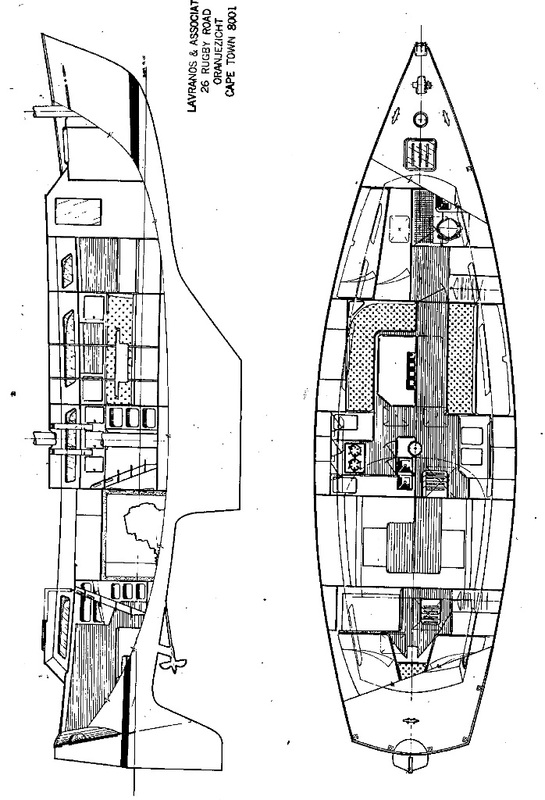 They also wanted a generous centre-cockpit, which Domicella has, but subsequent builds had an aft-cockpit and GRP hulls. I notice Domicella has conventional booms rather than the spars common on cat-rigs, of which I have no personal experience. I guess this makes reefing a bit easier, and being symmetrical, avoids the problem on one tack of the spar against the sail. 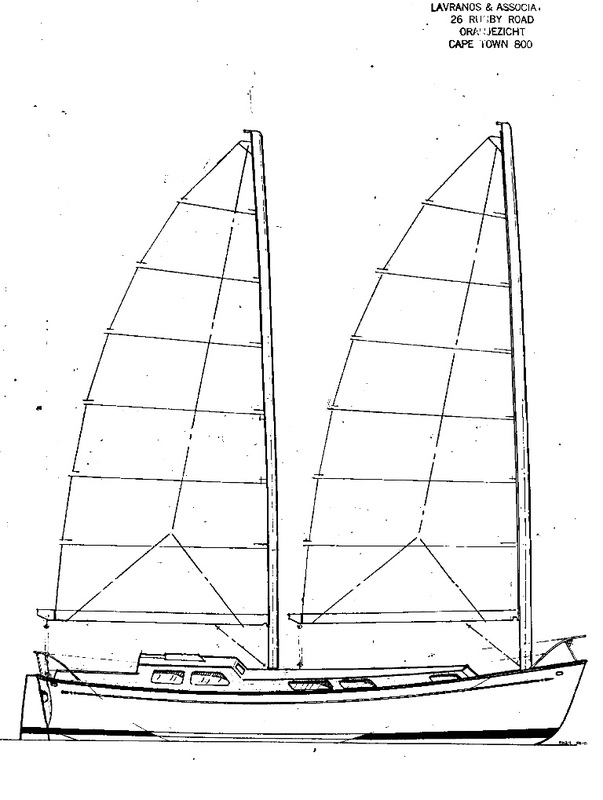 The other option would be a wishbone, but again I don't know how reefing works with a wishbone. The conventional booms seem fine to me. Other requirements included a simple transom-hung rudder, which is effective and simple to maintain/repair, and to fit self-steering to. The interior can be customised in many ways. So what are the pros and cons of "The Freedom Rig" as it's popularly known? Well rig theory is never a simple discussion - it can be debated forever. However there are some general points worth mentioning in a comparison with a coventional stayed "Marconi Rig", which designers have now almost universally gravitated to in recent times. 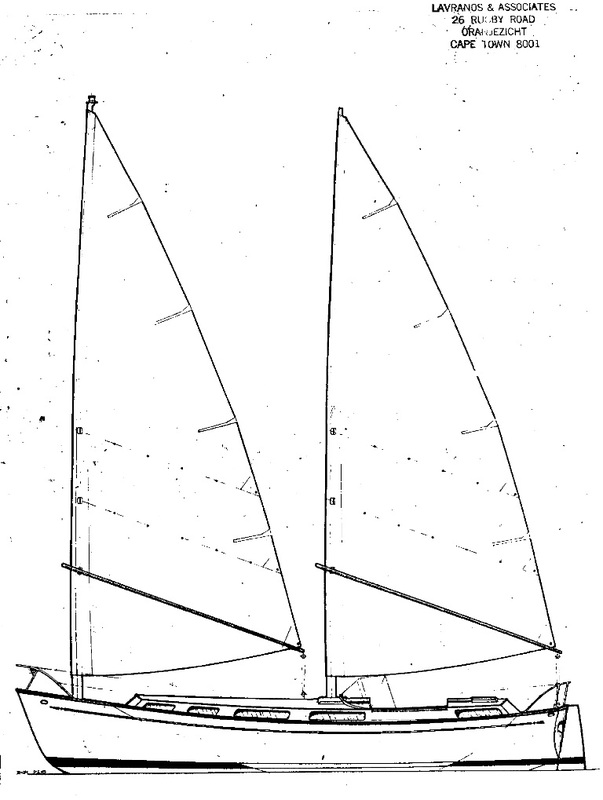 I should mention at this point that Lavranos offers a conventional sloop rig as an option too. - Storm reefing not ideal, though not bad by all accounts. The mains reef very deeply. 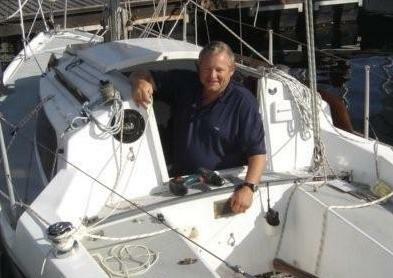 - Fore-mast presents unwelcome weight on the bow, but not as bad as say 100m of heavy chain! - Mast is high above water for light wind "topsail effect"
For purely trade wind or tropical cruising, this rig offers a lot. It offers so much for so little, even if you may need to carry some extra diesel for really light conditions. Its not the kind of rig I would chose to sail back to Cape Town from Rio however. It should excell in moderate winds and especially when reaching. But if you want to "really sail", get a sloop, cutter or not, they will reward your effort and have more flexible sail-plans for all conditions. Either way, the Pelican 42 is a great cruiser. 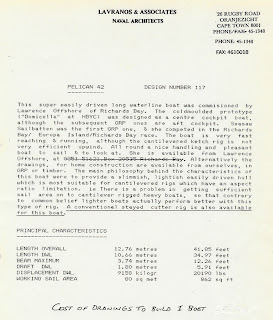 It has a very moderate hull with some clear considerations for performance, moderate keel, transom-hung skeg rudder. It won't have any vices, and should offer a good level of seakindliness with suprising performance. I like the centre cockpit version personally, but the aft cockpit version will have huge accommodations - though I haven't seen one. Domicella, of Hout Bay, has a suprising turn of speed off the wind. Lavranos has blended some quite modern light-displacement thinking into this design, and come up with great looks, fair performance, and elegant simplicity into this one! Definitely on my list of great cruisers, and a fantastic single-hander! I would opt for two carbon masts these days, and a decent engine. 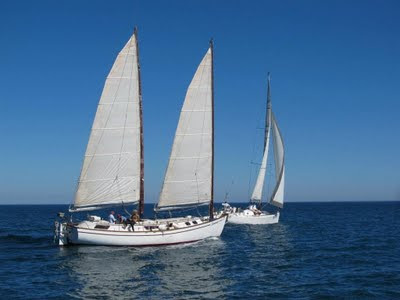 That way you will have a very comfortable, elegant cruising yacht with good sailing ability, and a motor sailer to boot. . . Inexpensive and a good effort/reward ratio. Roy can offer the materials and bulkheads precut which would make it much easier, also a Birdsmouth Mast Plan with Carbon Sock over it - strong and inexpensive. Cold-moulding is not the easiest thing, but with some reading and a bit of practise is not too difficult, besides the workload. She will also need extensive fairing. At 42' she is on the large side for a home build but is certainly not uncommon - Roys own (homebuilt) boat is 43'. The corinthian nature of the rig and general fittings (lack of) means you wouldn't be buying much, or even fitting much. Just need to get the labour sorted for the cold-moulding . . . Moderate keel with rudder well aft makes for responsive handling, but also good tracking. 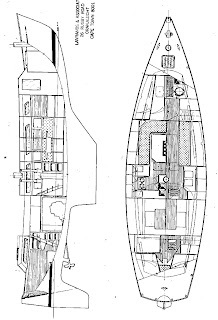 Cat Rigged ketch Option. Note the two angled reefing points, and almost complete absence of lines! Two unstayed masts with conventional booms, lazy jacks, fully battened sails with fairly full roaches. Unlike the cat rig, this option has kickers to keep the sail tensioned, but presents a fuller sail than the cat-rig, and the slot should work better too. Lazy jacks a plus . . .
All credit to both Roy McBride and Andgelo Lavranos for making all this material available!